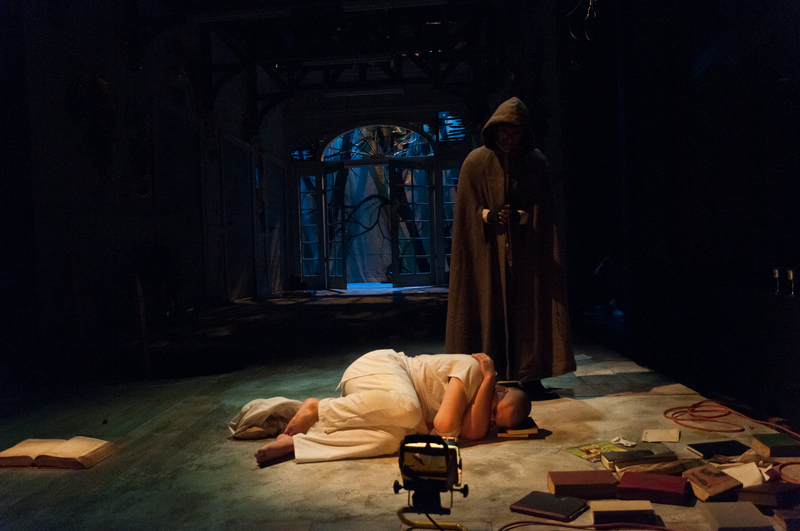 Set in an abandoned asylum, Faustus lies in the ruins as the audience enters. The sounds of the environment surround the space - wind, distant squeaks of dangling medical machinery and wildlife intermingled with echos of music and memories. He is watched over by the Good and Bad Angel. They enter, pick up the book, and explain the events that lead us to present circumstances- Faustus the scholar is deciding whether to turn his attention to the study of magic. The concept of the sound design for this production centers on the the arrogance and narcissism displayed by Faustus. He is a polymath, has studied and mastered every subject available - Theology, Language, Physics, Art - no one can match his knowledge and understanding. He is compulsively driven to study that which is forbidden to mortal men: Magic. compulsive scholarly endeavors. Facts, theories, lectures play endlessly in his head and haunt him in his dreams. Which he prefers before his chiefest bliss. An Old Man comes to Faustus, implores him to beg forgiveness from the Lord and reject Lucifer.